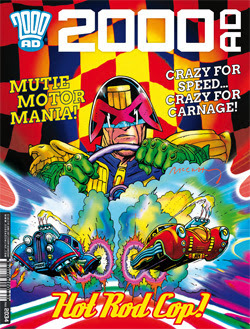 This issue completes this short story of Dredd. He goes out into the Cursed Earth, to get the missing son of the the Mega-City One citizen. The colouring is bright and fun, it gives us a bit of a break from the grim and gritty style we usually get. The ending was fun and fast paced and an excellent finish which is so typical Dredd! Bridgit gets to the bottom of all the issue with the ghost crew and the how it was done! I like the questioning of the chairman and the subsequent capture after. I still don’t think we’ve got to the bottom of it all though! Concluding Book 2 (with a promise of return) and the war is really beginning. We get a new red planet and some real problems for the people of earth. There looks to be another mission though and a way forward…. Going back to Nu-Earth and the world of Rogue Trooper we get a follow up from the previous Hunted arc. There looks to be some more vengeance going on, but some people are solidifying their power base! A slow build, but I like this series!